Citation: C N Trueman "Japanese Prisoners Of War"
Japanese prisoners of war, though a rarity for part of the Pacific War, were taken as the war neared its end and immediately after the war had finished. Many thousands of prisoners of war were taken after Japan surrendered in September 1945 after the atomic bombing of Hiroshima and Nagasaki. Japanese POW’s were made to repair damage done by their armies wherever they were camped. Japanese soldiers who had fought in Burma were sent to Rangoon to help re-build the city. They slept in tents made from leaves and mats. The ground was covered with sacking cloth. These POW’s, guarded by the British, were given bedding, a monsoon cape and each prisoner was given a mosquito net. Rations were issued on a daily basis.These men were kept in camps and guarded by Allied soldiers. As news spread about the appalling treatment of Allied POW’s by the Japanese at camps like Changi and the treatment of men during the Bantaan death march as an example, it was not unexpected that the treatment of Japanese POW’s was harsh – especially those Japanese soldiers who had fought in the Burma campaign who were blamed for so many atrocities against Allied POW’s. Those held in POW camps later complained about their treatment in these camps. While there were no obvious physical beatings carried out, men such as Yuji Aida, held by the British at a POW camp in Rangoon, claimed that they might be urinated on or used as a footstool for hours on end. One of the tasks given to Aida and others by the British was to provide a proper grave for British and Indian troops who had died in Burma and had yet to receive a proper burial. Bodies were dug up, their identity confirmed and then the body was put into a coffin and placed in a grave. The grave was then filled in and a mound built up above it. A cross was then put into the mound with the dead soldier’s name on it. Each of these graves was expected to be the same. If the Japanese POW’s were treated in a manner that would have stretched any understanding of the Geneva Convention, there was no outcry in any of the Allied countries. As more and more detail became known about the numerous Japanese atrocities throughout the Far East – be they against captured soldier or civilian – any sympathy that may have existed for conscripted soldiers quickly evaporated. Those Japanese who followed Emperor Hirohito’s order to surrender in September 1945 were seen as simply doing this – following an Imperial Order. Those who had surrendered to the Allies during the war were in very different circumstances. 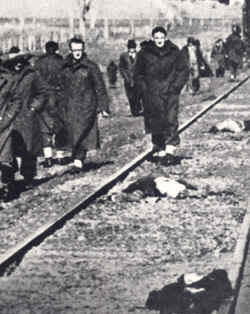 Rather than return home in shame after the end of the war, some killed themselves – see the photo above. By doing this they maintained a degree of honour both to the Emperor and to their family. They may not have died in battle, but they were not willing to return home alive while so many of their comrades had died in uniform fighting for their country.